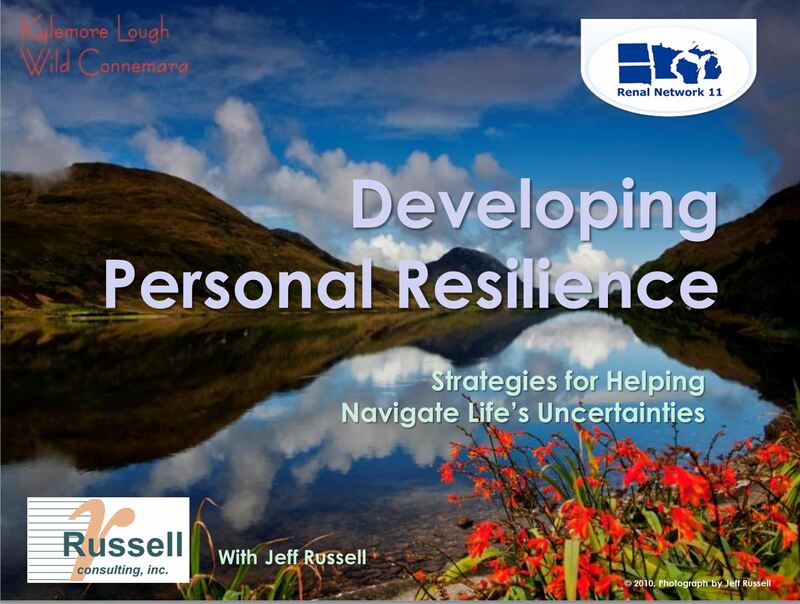 Developing Resilience – Russell Consulting, Inc. Helping build and sustain great organizations! Developing Resilience - Jeff presented his workshop on resilience at the 2013 Wisconsin Prevention Conference. The session focused on the power of resilience and the characteristics that enable someone to be resilient. Click on the graphic above or here (Developing Resilience) for a PDF version of the PowerPoint slides. Contact RCI for more information on our change management and resilience workshops. Click here to return to the full list of PowerPoint presentations. Change Basics Published in Japanese! Fearless Performance Reviews Arrives in Russia – and Ecuador! Check Out Our Recorded Webinar on Fearless Performance Reviews! "Provided very specific strategies that I will definitely incorporate." "The insights and takeaways are tangible and valuable." "Outstanding instructor with a wealth of experience!" "I've attended a variety of similar seminars. Jeff's workshop is definitely a cut above the rest." "You did an awesome job! I'm leaving with usable tools and concepts." "Jeff is an awesome instructor! He takes into consideration all learning styles, very open, great sense of humor!" "Jeff was engaging and had excellent tools/props/sense of humor." "Very practical and useful strategies that can be easily implemented." "The information that you shared has been inspirational and has helped me look at things in a new light. When I stepped back to look at situations in a more Collaborative Mindset way, it took away much of the anger I was feeling." "Jeff is a terrific speaker and does a great job of engaging the audience. I had lots of aha moments!" "I learned how to make my workforce a better team. A great program!" "Jeff really appealed to my learning style!" "There's immediate applicability of the ideas that you presented." "I liked the strategies for dealing with change and how to help people navigate the change journey." "RCI offered us a great set of tools that we're able to take back to our office/teams. They helped us understand the pros and cons of various decision making approaches." "Great training! Jeff was very professional and well-organized!" "Great session! I learned a lot and took away practical applications of the materials." "Awesome program that I would recommend to others!" "Jeff provides relevant solutions to real world problems. He also provides a format for you to develop your own personal and organizational action plans. I'd like to hire him." "Really interesting, thought-provoking and useful information." "Jeff is well-organized, has great photography, good content and quotes, created a respectful environment, stayed on topic." "Jeff is the best instructor I've had yet. His handouts were extremely helpful and his teaching skills were outstanding!" "Russell Consulting gave us excellent tools that can be used right away in my everyday practice." "Jeff has a great and effective sense of humor." "The strategic plan that you helped us to develop is the perfect centerpiece for the League. Thanks again for all of your help." "We hired Jeff a number of years ago to handle all our leadership development. Leadership development is one of the leading issues facing CPA firms as we try to replace aging managers, owners and leaders. We selected Jeff because of his knowledge, experience and willingness to customize his training programs to fit our firm's culture and core values. Needless to say I have been thrilled by the results. The most recent session on performance reviews got rave reviews from my managers and has definitely improved the quality of leadership in our firm. I have used many trainers over the years, Jeff is and will be my first choice!" "The work you did in writing your book 'Fearless Performance Reviews' is the best treatment I've seen on what can be a very challenging process for leaders at all levels. I especially appreciate the collaborative mindset approach - it very much resonated with me and I truly believe that is how it should work. Thank you for the very good work you have done and continue to do!" "Jeff provided my team a unique opportunity to explore change management and influence techniques. His professional, insightful and pragmatic approach to delivering content was extremely effective. Highly engaging, Jeff's style enabled my team to discover for themselves new capabilities and approaches to driving business change within our organization." "Jeff designed and taught a strategic planning course for us that specifically identified the strengths and weaknesses of our current methodology. More importantly, he inspired my team to take risks, try new approaches, and continuously challenge our techniques. He did this without ever allowing the team to lose pride in the work they had done. Jeff is an outstanding consultant, teacher, and advisor. I highly recommend his work and his professionalism."